Lawn aeration will help make the most of fall seeding and fertilizing. Fall is here and that means one thing: Football! Well, actually it means two things: football and fall lawn care. Lawn care season and the football season kind of run counter to each other. While with football the spring and summer are for training and fall is game time, it’s the opposite for your lawn. You need to use the fall to prepare your lawn so it’ll be ready come spring. To help, we have your “Fall Lawn Care Playbook,” with a different topic each time. 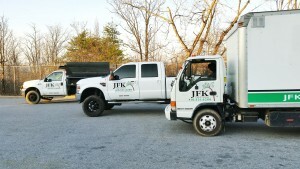 This week, we have lawn aeration, necessary to making sure your lawn is getting the right fuel during the fall growing season. Aeration is the process of introducing oxygen and water into soil that has become too dense to allow air, water and nutrients in. The soil becomes dense by compacting of solid particles. By perforating the soil with a large number of small holes the air, water and nutrients can reach the grass roots that desperately need them. 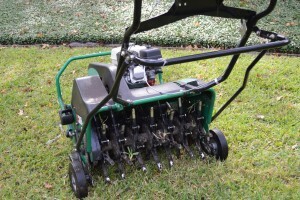 There are two types of aeration tools, plug aerators and spike aerators. Plug aerators remove a core of soil and allow for more aeration than spike aerators, which just use a metal tine to poke small holes in the ground. Introducing fresh air and water to the soil can promote a thicker, healthier lawn and make it more disease and pest resistant. The small holes created through aeration also improves fertilizer absorption by breaking down thatch build up. Thatch is the layer between your green grass shoots and the root system beneath the soil. It is made up of a mix of living and dead leaves, stems and roots. Thatch can be good for your lawn, as long as it doesn’t get too built up. This entry was posted on Friday, September 9th, 2016 at 4:30 pm. Both comments and pings are currently closed.